Davis will probably win. Justified or not, it’s been my observation that the Academy tends to take advantage of it’s opportunities to celebrate diversity. I’m really tired with the whole ‘diversity’ thing. I’m hoping they can just award based on performance, but it usually goes in to a career thing, political, image, pr, hoopla thing too. Whatever. But you are right I’m sure. 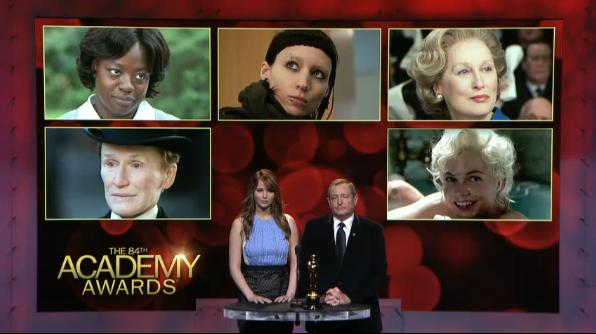 btw, Meryl is so awesome. Not just as an actress, but anytime I have seen her interviewed or give an acceptance speech she is so natural and goofy and likable. I hope she wins too! Why thank you for stopping by and finding me! Glenn is awesome in Damages on TV which she has received accolades, but Meryl is due darn it. I have seen no Oscar-nominated films except Rango. I am aware this makes me both sheltered and strange for then hosting an Oscar party. But I hope Meryl wins – I’ve loved her since Death Becomes Her. Hugo is good too, and The Help. I usually try to see as many as I can. It’s my movie geekness in me. I actually didn’t think Rango was that great. I’m going to try and watch The Help tomorrow and The Artist is at the art theatre a few blocks from our place so I may try and get my husband to go see it tomorrow night too. I loved Rango’s dark humor and drunk reptiles. I think I liked Puss in Boots more for those same reasons, all the egg sort of weirded me out hah.